As a more-than-casual bicyclist in Portland, Oregon – one of the most bike-friendly cities in the world – I enjoy covering news of electric bicycles and related products. Unfortunately, most e-bikes are fairly expensive – more than than the combined cost of both bicycles I currently ride – so the appeal is somewhat limited. The RideKick, however, seemed to have the potential to economically covert an existing bicycle into a sort of e-bike by using an electric-powered cargo kit to push a rider. After testing the device, my feelings about the RideKick are varied. 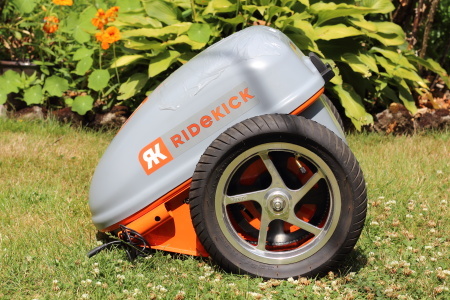 First, the RideKick is much bigger (2 ft. wide, 3 ft. long and 1 ft. tall) and heavier than I imagined, and a good portion of that weight comes from the battery pack (almost 20 lbs.). So, if you’re thinking of having the product shipped rather than picked-up from a retailer, keep that cost in mind. Second, the unit came with a very nice letter from the company as well as some stickers and brochures. I don’t think I’ll be passing them out like political pamphlets on street corners, but at least one sticker is now on someone’s beer refrigerator in the Pacific Northwest if that’s any consolation to RideKick’s marketing department. In all honesty, I found that the top hatch was made of fairly thin plastic, but the base and wheel system was sturdier than expected, which built my confidence in the product a bit. The idea of having a device pushing me and my bicycle to a claimed 19 miles per hour by only being attached to the back of the bike’s frame with a few screws was unsettling, to say the least. 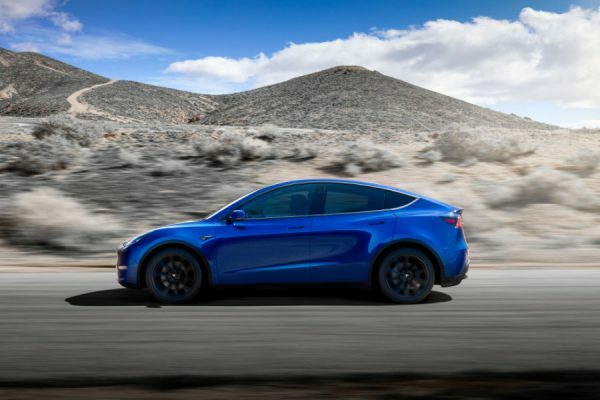 In addition to being worried about propulsion, I was concerned that the trailer, especially with the electric battery attached, would be burdensome when starting to pedal from a complete stop. Although there are several steps and a few different pieces in the RideKick kit – battery pack, throttle, trailer hitch, etc. – the process to attach the unit to a bicycle is fairly easy, especially if you have a quick-detach back wheel. The entire un-boxing to riding time can be done within an hour if you’re enjoying a lazy afternoon. As I found out, it’s very important to place the electric throttle as close to your bicycle’s back-brake hand trigger as possible for comfortable riding, as this will allow you to hold down the throttle and switch to a tight stop in case of a roadway emergency on a moment’s notice. Rick Perry Solar Power Stance Is…What? Ridekick and all e-bikes need to have an infrastructure where they can be recharged (preferably at a coffee shop where the rider can enjoy a refresher too) nnThis is a big hint to any restaurant chain or franchise that wants more customers, and to all manufactures to come up with a universal international agreementu00a0on a useful recharge system. I bought a Ridekick power trailer four weeks ago. My Ridekick cost me about $750 in the Beach & Beyond bicycle shop in San Diego CA. This is a substantial investment. That’s why I decided to keep a diary of how the Ridekick works and how I use it. Anyone who’s considering buying a Ridekick may be interested in my experiences. I hope to keep adding to this Ridekick Report as the years go by. Many reviews and testimonials by consumers are written when the purchase is still new. What I like to hear is how the gadget works after it’s been used for several years. I don’t know how I will use the Ridekick in the future, but I can tell you what my bicycling life is like now: I’m a 69-year-old former army officer, cartoonist, writer and teacher. I’m in good health except for Type 2 diabetes. I’m about 6’1″ and weigh about 200 pounds. I’m starting to notice pains in my ankles and knees. I’m not prosperous. The only way my lady friend and I can afford any luxuries — like the Ridekick — is by living very economically and saving far in advance of any purchase. I’m writing this in February 2012, in San Diego, where by scrimping I can enjoy three months in the sun this year. My real home is in Bellingham, Washington, a small city built among high hills. Bellingham is a nice place with a generally cool but not cold climate, but the nights are long in the winter, the skies are grey, and it drizzles constantly. I learned to take bike-riding seriously when I was an American teenager in Germany in 1961. I’ve always biked as many places as I can. I’ve never been an athlete. I’m usually overweight and a slow peddler. When I come to a hill, I get off and push. I had a Raleigh Grand Sport for forty years. The Raleigh was so tall that I couldn’t touch the ground with my toes while on the seat. At age 60 I noticed I was starting to have near-falling-accidents. I always wanted a recumbent bicycle, so when I saw a Trek R200 recumbent in a store I impulsively grabbed it. Since then I’ve fallen in love with my recumbent. Not only is it super-comfy, but it’s safer, because I can put both feet flat on the ground without leaving the seat. The Ridekick is new technology. There’s nothing new about having a battery, a motor and electronics on a bicycle. 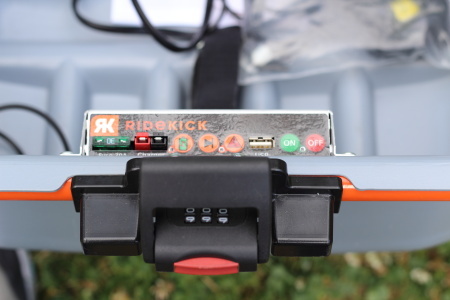 What’s new in the Ridekick is the way it puts the hardware in a trailer that pushes the bicycle, instead of having the hardware built onto the bicycle.At age 68, I noticed I wasn’t getting out as much because of hills. I started thinking about electric propulsion. But I couldn’t bear the thought of leaving my R200 behind. I didn’t think I could ever get used to riding a conventional bike again — sitting on your prostate gland at my age isn’t nice. Investing in new technology is always risky. I’m not a ‘fixer’ or a good engineer. I’m a tech freak and have often been burned by new stuff, most notably when I bought an Apple III computer in 1984 instead of a PC. Because of that experience I will never touch an Apple/Mac product. Even my Trek R200 was glitched. After producing a small number of R200s, Trek Corporation decided they didn’t want to be the only major manufacturer that’s ever created an unconventional bike, and they terminated the program. Hence my R200 is a rarity, a curiosity, which only makes me love it more. That’s why, when I stumbled across a reference to the Ridekick online, I felt a tremor of consumer frenzy. 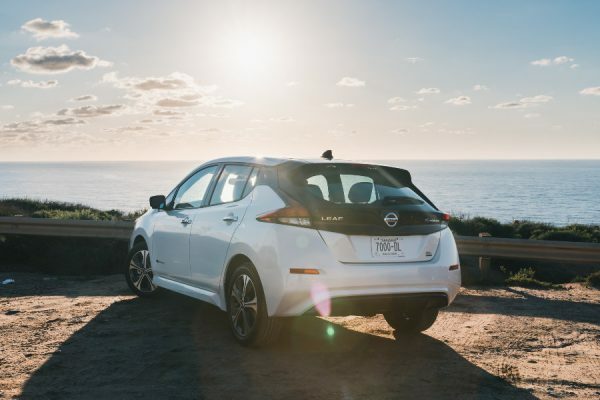 The Ridekick solves every objection to electrifying my ride. I don’t have to give up my R200, the Ridekick works with any bicycle. I don’t have to modify my bicycle, or carry a battery and motor on it when I don’t want to. I don’t have to do any engineering of some system that is designed for a conventional bike. I don’t have to DO anything! Yay! Best of all, the Ridekick costs less than half as much as the cheapest, least satisfactory scheme for electrifying my unconventional bicycle I have ever discovered during years of investigation! These first few weeks I’ve been on several five to six mile electric rides in good weather. So far the Ridekick has shown no problems. On dry pavement it has plenty of traction. The only time it has spun its wheels a little is on hard dry sandy trails or when bouncing over bumps and sticks on the road. The trailer is no wider than I am on my bike, and it follows closely. The Ridekick has never gotten a wheel hung up on anything going around a corner. When I pedal on a flat road, I don’t feel any resistance or any pulling-back from the Ridekick trailer. On uphills, it immediately makes itself felt; that’s when you push the thumbswitch and go into power mode. On my last outing, I asked the Ridekick to push me up a paved alleyway from sea level to a nearby 400-foot-elevation (OB to Point Loma, for you Diegans). The Ridekick enabled me to pedal up this mountain, past the mansions of the wealthy, until the alley reached a grade of about 30%. At this point I got off and hiked, with little spurts of torque pushing the bike for me. This part of the climb was about one block long. The rest of the way, I rode, assisting the Ridekick by pedalling. Before the Ridekick I climbed this hill by pushing the bike up the whole way. Does the Ridekick decrease the amount of exercise you get? I suppose it does. But I don’t ride for exercise, I ride to go places. So far, I think the extra peddling I do to help the Ridekick makes up for the peddling I don’t do because of the Ridekick. — To zoom fast across street intersections and around corners, after having come to a stop for traffic, etc. This is a big safety plus. — To ride up hills I previously would have walked up. — To swiftly cover flat straightaways against headwinds. My technique is to use the Ridekick, while peddling, to zoom up to ten MPH, then pedal without it until it becomes a grind, then zoom again. — To carry cargo. The Ridekick holds my fleece jacket and four or five library books, or two gallon milk jugs. I assume the extra weight adds traction to the device. My cat won’t allow me to put him inside, even though there’s space for him inside. As I said before, on the flats I don’t feel any drag from the Ridekick. My riding technique has always been slow and conservative. I ride slowly and on the sidewalks except when this is impossible. On most rides so far, I estimate I only use the power about 20% of the time. So far riding on sidewalks towing the Ridekick has been no problem, even downtown. Slow and patient gets me there every time. I always consider the battery range while thinking about an outing with the Ridekick. The instructions say 15 miles. I’ve never tried to ride that far yet. 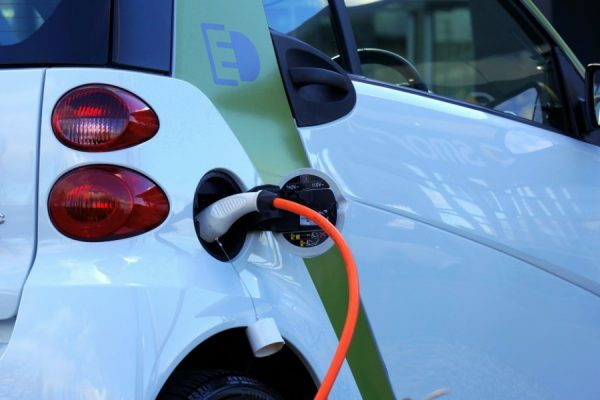 Yes, the charger is small and portable, but it takes several hours to recharge the battery from ‘low.’ You would not want to tow a dead Ridekick over any hills. The uphill trek I described earlier drained the battery from L9 (full) to L2 (almost empty). Five to six mile excursions without big hills drain it to L6. The Ridekick really takes a beating; you can hear it banging along behind you on a bad road. The instructions say leave the tires soft. The Ridekick isn’t as flimsy as it looks. Its case is surrounded by a tubular steel frame that looks ready for business. Running errands and exploring takes me and my bike to rough places. If you’re using a Ridekick, expect to lift it, with your connected bicycle, up and down curbs and other bad spots. My rides take me across freeway on-ramps with extra-high curbs and lots of careless drivers. I deal with these by stopping and planning my moves before starting into the death zone. Usually it’s safer to do it on foot, pushing my bike and Ridekick, ready and in the right position to lift, first the bike, then the Ridekick, when I have to. My Ridekick is already scuffed and grimy from the road, but it keeps on purring along. The Ridekick is heavy for me (40 lbs). I can’t lift it easily. I thought I would be able to unhitch it and take it as baggage aboard busses and trolleys, but now I don’t think that would work. The Ridekick exceeds size regulations for San Diego busses. — a suitcase-like carrying handle on its leading side, attached to the metal frame. — a backpack-type harness so it could be carried on your back. — a quick-remove socket for the tiller that protrudes from the front of the trailer. This tiller makes the Ridekick more awkward to carry than it already is. — two simple padlock hasps and a lift-off lid instead of the classy but hard-to-see combo lock & hinge suitcase arrangement it has now. So now I bid my readers a temporary good-bye and I whir off into the future, propelled by my faithful Ridekick. I hope to send you another report after I have used it in Northwest Washington, the land of rain and darkness. Hello Rick…Is there anyway to post the manual for the RideKick? You might be able to download a .pdf version of the manual from RideKick. How does the RideKick control being jack-knifed when riding? I presume you mean, does the RideKick try to jackknife with the bike while it’s pushing? I’ve never observed it do so. The RideKick is connected to the bike’s rear axle by a rigid steel tube, which keeps it at a constant distance behind the bike, so it can’t ‘catch up’ to the bike. What would happen if the bike hit something and came to a sudden stop? I think the RideKick would stay put, and spin its wheels on the pavement until I took my thumb off the electric switch. no, I’m being punished again for trying new technology” feelings. brain and the USB gizmo via return Fedex, provided by Mike. Ridekick that messed up its firmware. freed the clutch, and everything was OK again. off the wheel. Fixing this was merely a matter of getting my fingers greasy. paces. I’ll send another report in a few months. Rick, thanks for this great write-up. These cost $699 on their website. Why give the impression that they are $729 and let someone wonder about an additional shipping cost? If you go to their website and click on dealers you will find them also selling for $699. and of course the shipping is extra. My closest dealer was in Dallas, Oregon and it was also $699. And I was very glad to help out a “Mom and Pop” bike store.